August 2014 marked one hundred years since the outbreak of World War I, a highly significant watershed. Melbourne, as temporary national capital, was the centre of Australian wartime operations, and thousands of Victorians lost their lives or were damaged by the conflict. We created an integrated mobile experience that offered visitors a complimentary layer of content in addition to what is physically available throughout the gallery and museum. The mobile experience included off-site modes with content that visitors could engage with before and after a visit to the museum. 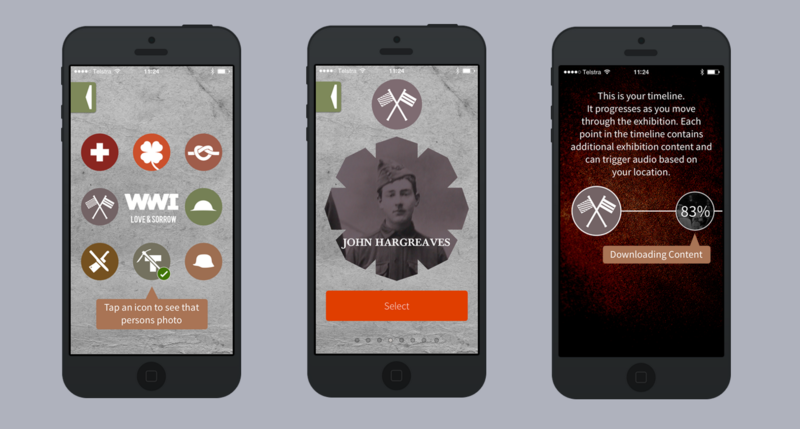 When using the app, visitors selected one of eight characters to frame their journey throughout the exhibition. 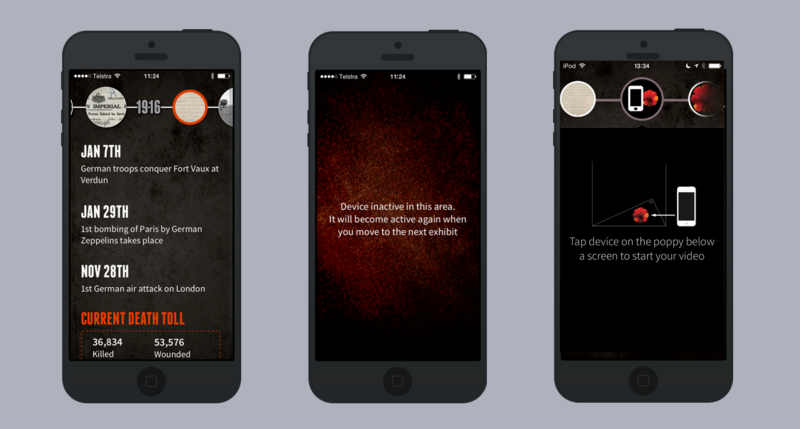 Utilising beacon technology as triggers (over thirty), the app delivered relevant content to visitors' mobile devices based on their proximity to a specific gallery zone and the chosen characters. This presentation explores the development of the app and its integrated role in the overall exhibition experience. 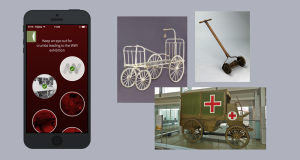 This is the first time that Museum Victoria has relied on mobile technology to such an extent; this is our first truly integrated app/exhibition experience. We worked with Art Processors to develop a unique app and experience; the exhibition opened on August 30, 2014. World War I was a tragedy on an almost unimaginable scale. One hundred years later, its effects are still felt. August 2014 marked one hundred years since the outbreak of World War I—a highly significant watershed in Australian history. Melbourne, as temporary national capital, was the centre of Australian wartime operations, and thousands of Victorians lost their lives or were damaged forever by the conflict. 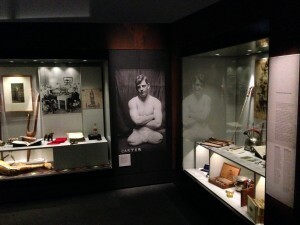 The major element of Museum Victoria’s commemoration is a 210-square-meter exhibition at Melbourne Museum. The exhibition explores the four years of conflict and beyond, presenting the war as a one-hundred-year story to which Victorians today are still connected. It focuses on the impact and aftermath of war for Victorians: particularly the damage to the soldier’s mind and body, and the broader effects upon the community from the conflict. It draws on Museum Victoria’s own rich object, photograph, and document collections and includes significant digitisation of these resources, creating a long-term legacy for all Victorians. The World War I journey at Melbourne Museum commences from the foyer with a “trail of breadcrumbs.” These act as teasers and provoke curiosity through the choice of object and its simple associated statement or question. Five breadcrumb objects lead visitors from the foyer to the exhibition on the first floor. The overriding principle in the development of this exhibition was that the story of the war is told through the personal experiences of eight characters and their families. Whilst the journey is led by personal stories, the path unfolds in a broadly chronological order. Together with year markers, themes indicate the war’s progress: The Spirit of the Times, The War Experience, Wounds, The War at Home, and Life After War. The personal touch is reflected in the object case layouts: objects are placed in an informal and personal style to look like they’ve fallen in battle or like someone has just walked away from using them, rather than in formal straight lines or traditional pinning. The exhibition explores the true cost of World War I, focussing on the short- and long-term impacts of the conflict on individuals, society, and the nation. It does not shy away from difficult content that is often avoided in accounts of the war, such as facial and psychiatric injury, and uses personal stories to present a range of perspectives. It stimulates debate and generates new ways of seeing and understanding war in our society. Reinforces Museum Victoria’s international reputation as an outstanding provider and motivator of intellectual research and state-of-the-art display and interpretive technology. Modern reconstructive surgery is indebted to the war’s early experimental efforts. For younger audiences of secondary school students, the exhibition provides context around the global, local, and intimate personal impacts of World War I. For the older audiences, the focus on local and personal impacts of the war enhances their understanding of connections within their own family history. We have developed an integrated mobile experience that offers visitors a complementary layer of content in addition to that which is physically available throughout the gallery and museum. The overall digital experience includes off-site modes with content that visitors can engage with before and after a visit to the museum. The exhibition website (loveandsorrow.com) provides a marketing opportunity to promote the exhibition, its themes, and a few snippets of content from the gallery and mobile presentations. 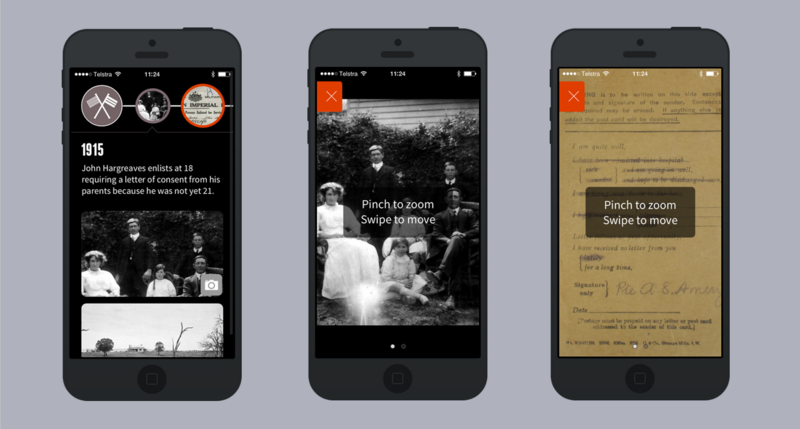 Visitors are prompted to download the app prior to their visit to the museum. This prompt is beneficial to both the visitor—if they already have the app loaded on a device they bring with them, there’s no extra hassle to get it once they arrive—as well as the museum—we don’t need to provide and manage as many loan devices. Once downloaded, the app has minimal content. An exhibition video trailer can be viewed that sets the scene for the exhibition and the idea of character selection (the same video can be viewed via the exhibition website). The main content is not available until the mobile user is at the museum. There are checks to ensure that Bluetooth is switched on (for listening out for the content trigger signals), that they’re located at the museum, and that Wi-Fi is available. Once these conditions are met, the visitor can begin the experience. On arrival at the museum, a series of Bluetooth low energy beacons (see next section) at the entrance trigger a device notification that, if activated, launches the Storyteller app and shows the visitor they have just found the first “stop” on the trail of breadcrumbs. These stops lead from the museum entrance through the foyer and admissions area and up to the exhibition gallery. After following the trail, the visitor is at the entrance to the exhibition itself and can commence the immersive experience. Originally, the breadcrumbs were planned to be more integral to the narrative, progressively revealing parts of our characters’ stories. As the gallery experience became more detailed, however, we reduced the prominence of the non-gallery stops to act more like markers along the way. Upon entering the gallery, a series of characters are introduced by way of portrait and family photos, along with basic name, age, and occupation details. Each character is also assigned an icon, which assists recognition of appropriate content stops through the rest of the exhibition. The character portraits are also shown on the app, and the visitor must choose one to guide them through the exhibition. When a choice is made, all the digital resources for that character are downloaded as a “package” over the Wi-Fi; this generally takes ten seconds, although if there are many simultaneous users, this can slow considerably (a well-known Wi-Fi limitation). As the visitor proceeds through the exhibition, a timeline across the top of the app screen shows when new content is available for the character they are following. An audible tone sounds, and a new story icon highlights. When the icon is selected, a “page” of content appears under the timeline. This page is scrollable and can consist of text, images, audio, and video. Text is kept to a minimum. Photos are zoomable and have caption information. Audio plays when selected, has transcripts, and can be controlled by the user. Not all content in the app is character connected. There are pages for each of the four years of the war, which provide an overview of the major events and tallies of deaths and woundings. Other pages are significant stories interspersed through the timeline and are presented to all visitors. Content availability is triggered by Bluetooth beacons, just as the breadcrumb activations are. In the gallery, however, the app is not listening for all beacon signals, just those that are relevant to the chosen character or those marked “everybody” (the year and significant story content). The final section of the exhibition is a video presentation triggered by the app. The visitor taps his or her device on one of the gallery screens, and a descendant of the chosen character appears and talks about the ancestor and World War I memories. Upon leaving the exhibition gallery, visitors can lay a symbolic poppy within the app and share a reflective comment or thought. Beacons are simple, cheap battery-powered devices. They are small (around the size of a matchbox), light, and can be located out of sight behind built forms. Battery life needs to be considered; there is evidence that early units on the market can suffer rapid battery loss when configured to emit strong signals. We have placed all our beacons in accessible areas to make battery changing easy. New beacon models are appearing on the market all the time, including USB and 12-volt powered units. We may investigate these in the future, as power could be drawn from a constant supply negating the monitoring and changing of batteries. In the case of our breadcrumbs, the beacons simply trigger checkmarks against the crumbs the user passes close by. In the gallery, the content is sent to the app over Wi-Fi once a character is chosen, and then proximity to a particular beacon triggers access to the relevant portion of that. Most often, beacons are thought to be specifically made devices such as those described above. Less known is the fact that mobile devices (smartphones, tablets, etc.) can be set to be beacons as well. We do just that through the app to trigger the final farewell video playback on the gallery screens. We worked with Art Processors, who helped us to refine the mobile experience concept, to provide user interface and user experience (UI/UX) design, the content delivery solution, content management, and software development of the apps (iOS and Android). We envisaged a modular content platform that would provide access to content efficiently in phases, as per the visitor’s character selection and their proximity to locations within spatial zones in the gallery and museum. This “lazy loading” of content has been cleverly structured not to impact the visitor’s journey and to create a seamless user experience. The interface design does not overwhelm the visitor with a multitude of options or decisions that need to be made; it is clear and intuitive and feels connected and relevant to the specific gallery experience at a given location and time. The device offers “character moments” for visitors to follow for their chosen character and “everybody moments” providing contextual and timeline-based details. Content is revealed to the visitor; once they move into a new zone, the information from the previous zone slowly fades out of view. This streamlines information delivery and enhances the context-sensitive nature of the content. Content types delivered on the device include audio, video, imagery, and text with some interactive elements (swiping, transitions, menus, etc.). 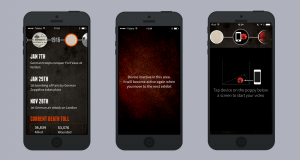 Sound design throughout the exhibition has been kept to a minimum; the app is the main source of audio. In the final section, we designed a visitor-initiated gallery activity. When a Storyteller device is tapped below one of a number of gallery screens, a video relating to the visitor’s chosen character is played. To achieve this, the museum’s technical staff and Art Processors worked closely to configure the app and the gallery media control systems appropriately. The Storyteller app has been developed for iOS and Android. Observation shows that these platforms will suit the vast majority of our visitors. We plan a formal study to properly understand the devices our visitors bring along when they visit. If Bluetooth and Wi-Fi are not already switched on when a visitor enters the museum, the app prompts for those settings before proceeding further. Some visitors are less confident with the operation of their mobile device (loading apps, adjusting settings, etc). We have developed quick guides for visitors and staff to refer to in order to set up the app. For those who have no device of their own, bring a non-supported device, or simply prefer not to use their own, we provide iPod Touches and iPod Mini tablets for loan at no cost. These devices are available in the admissions area and managed by the ticket desk staff. 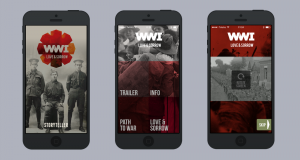 Melbourne Museum offers free public Wi-Fi, and a specific World War I channel has been established in an effort to remove as many technical barriers to visitors as possible to support them using the app in the gallery. We have configured our network to streamline the download of the iOS version of the app by hosting a local mirror. No such option is available for the Android download. Signage in the museum foyer, the ticketing area, at each of the breadcrumb objects, and at the exhibition entry is used to promote the app. The dedicated Wi‑Fi channel has been optimised at the signage locations to ensure speedy downloads. The exhibition website (loveandsorrow.com) is designed to highlight and direct people to the app stores to begin their exploration of the exhibition. The website is an integral part of the visitor journey and sets the scene for the physical exhibition experience. The experience has been designed as an integrated one, using handheld devices closely associated with in-gallery media, objects, and text elements to enhance the narrative we are conveying to the visitor. This is the first time that Museum Victoria has approached delivering an exhibition with multimedia technologies so tightly integrated. Without the app content and guidance, a lesser experience is offered. The app is not essential but definitely enables a richer experience. The exhibition is compelling and confronting, aspects that are enhanced by the intimate nature of the story told firsthand by the families of the selected person delivered through the app. The overall exhibition experience developed for WWI: Love & Sorrow shows how many and how varied the options are for involving our visitors deeply in the story we are telling. 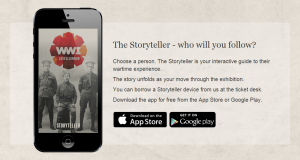 The Storyteller app is named well and really assists by bringing the visitor closer to the stories and lives of the key people featured in the exhibition. New technology implementation requires a period of bedding in; the Storyteller app is no exception. Art Processors have been terrific to work with and have helped and worked as excellent partners throughout the process of delivering the exhibition and app. Bluetooth beacons (and networks of them) require careful “tuning” to enable accurate location trigger results. As this accuracy is a key requirement for a seamless user experience, a great deal of effort has gone into ensuring the best outcome. The revealing of content and alerts to the device at the correct location is critical; we underestimated how much time would be required to complete this work. The nature of the trail of breadcrumbs was diluted somewhat with the decision for the objects to become markers rather than revealers of parts of the story. The distance between the foyer objects and those close to the exhibition leaves a large gap in the middle of the trail. While we have interstitial signage to help fill the gap, the sense of a trail of discovery has not been as fully realized as we’d planned. The amount of content available on the app when out of the museum or exhibition is an issue for some; striking a balance between the in-museum and out-of-museum experience is challenging. We have deliberately chosen to only reveal character content when the visitor is in the museum. There is ongoing discussion about whether to let the material uncovered during a visit continue to be available for review or sharing post-visit. A major challenge was to present all these types of content in a meaningful way. With traditional gallery displays, touchscreens and interactive immersive projections, characters, icons, colour codes, and all the app content, the design language and content coordination was crucial to achieve a cohesive experience. Something that has worked extremely well is the character selection. This concept provides a very rich, rewarding, and often surprising experience. The app and its design and content provide a depth to the story that could not be achieved with object labels and wall text alone. The context-sensitive delivery also makes if far superior to a standard audio-guide experience. We have had terrific feedback about the overall exhibition experience, including the Storyteller app, and by the time this paper is presented, we will know more! Art Processors’ ENSO platform logs all activity from breadcrumb checkoffs, character choices, content access, etc. Together with a comprehensive in-gallery evaluation program run by our Audience Insights team, the access data and visitor observations will provide a rich image of how our visitors are using the digital in conjunction with the physical. As the data gathered starts to draw a useful picture, we will not only be able to tweak the content and delivery systems, but also share our findings so our colleagues may benefit from our experiments. The WWI: Love & Sorrow exhibition and its accompanying app has provided Museum Victoria with the opportunity to use a suite of new technologies to push the boundaries of interaction design for our visitors. The overall experience, whilst not unique, unfolds quite differently to a conventional audio/video in-gallery guide. The context-sensitive nature of the experience is more seamless and intuitive than other “self-guided” augmented experiences. It is too early to fully evaluate how successful this has been. What is clear is that the process undertaken internally and our collaboration with Art Processors has opened up a new avenue for us to explore with our visitors. Our goal was to provide an intimate and personal experience using the mobile-device format to deliver rich content within the gallery. We have not produced a “narrowcast” audio guide, but rather created a user experience on the device that is connected to what the visitor sees around them and is responsive to their location and behaviour. It enhances their connection to the exhibition characters and allows for further opportunities to engage with their stories. We believe that the incorporation of location-based content delivery is an excellent method for building integrated digital experiences for our visitors. As such, we see this project as a test/pilot project, which we hope will inform future similar and perhaps more “courageous” implementations. In order to understand how the app, content, and experience are being used and appreciated, we need to ensure we can set measurement goals for analysis and possibly adjustment of the experience within the life of the project. We would like to congratulate the team for exploring a new technology and developing an engrossing experience for the museum visitor. The depth and thought that sets this exhibition and experience apart has come from the execution of an excellent collaborative process and a willingness from all parties to push boundaries. Hard work and creative thinking coupled with excellent and sensitive research underlie what has made this a very moving and deep engagement for the visitor. We would like to acknowledge the curatorial leadership and research of Deborah Tout-Smith, who has developed the concepts and stories that drive the strong exhibition narrative. The exhibitions central narrative idea was inspired by Dr. Marina Larsson’s 2009 book Shattered ANZACS: Living with the Scars of War. The exhibition design by Freeman Ryan and Streamer works in a sensitive and imaginary way to support the complex, moving, and confronting stories that are woven throughout the exhibition. The multimedia is tightly woven into the exhibition layout and supported by the Storyteller app—the whole being far more than the sum of its parts. Art Processors, with Museum Victoria staff Charlie Fry and Monica Zetlin working with multimedia producer Becky Freeman, have developed an excellent suite of multimedia experiences across multiple platforms that work seamlessly to support the object-driven narrative and bring to life the stories of the eight people and their families. We would also like to acknowledge the consummate project management skills of Judith Penrose in the overall delivery of the exhibition. Larsson, Marina. (2009). 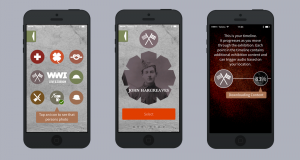 “Shattered Anzacs: Living with the Scars of War.” UNSW Press.
. "Storyteller – World War One: Love and Sorrow: A hybrid exhibition mobile experience." MW2015: Museums and the Web 2015. Published February 19, 2015. Consulted .